hello, my friends! 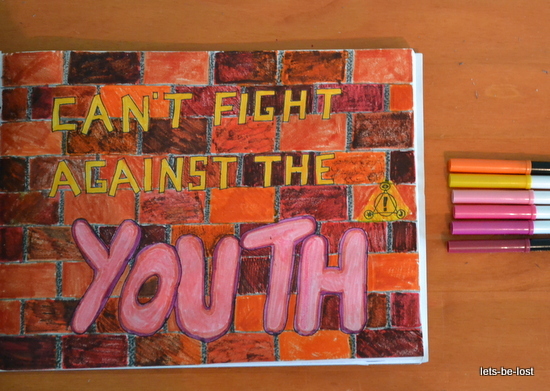 i spent my saturday working on the rather disappointing drawing above, which was inspired by the song can’t fight against the youth by panic! at the disco. if you can’t tell, it’s supposed to be graffiti — which is viewed by most as disrespectful and horrifying. why are you getting so worked up about some drawings on your boring buildings? it’s art. you never hear about middle aged people spraying designs on walls. it’s always the youth. and no matter what you do, these kids are still going to be rebellious and daring and making choices their parents would never make. that’s how this works. can’t fight against the youth. keep kicking. put up a good fight. listen to the sound of your children revolting (beaten in lips // beartooth). oh, and happy easter. have some chocolate. I think it’s really pretty! Definitely good use of your time. Wooh! Youth power! There are people who are paid to graffiti buildings and it’s legal and stuff cause they want that artwork. Because it is beautiful and it is art. Why not search out those opportunities instead of spraying someone’s building in the dead of night? And why do we as the youth, always think we are in the right? Sure, we will do the right thing when the generation before us couldn’t or wouldn’t, but we forget who made us. We are only who we are because of the people who came before us. These opportunities that we have to be daring and bold and go out into the world? Let us never forget that the people before us bled and died for those. We are the youth now, but we will be middle aged soon, and will we so easily be forgotten? Your picture is cute! And I actually struggle with graffiti- the type that people like, want kids to do? that’s cool. The ones that say bad stuff that I see on the sides of people’s houses? that’s not cool. Also: I kidnapped your blog button. Have a nice day! In the Czech Republic, in a city called Karlovy Vary, there are these tunnels, and these teenage artists spray paint amazing paintings on the walls of the tunnels, and it is so awesome! I love the picture you drew! Happy Easter Loren! My Mom got me a pack of TWO HUNDRED orange tic tacs which I’m pouring in my mouth right now, and a solid dark chocolate easter bunny. So my Easter’s going pretty great, how ’bout yours? The Easter mass this morning was beautiful at my Church. The funny thing is that today started out sunny and now it’s pouring rain outside. Kind of ironic for Easter Sunday, huh? I love graffiti. Not when it’s swearing, but in places like Bristol you get the most beautiful artwork and it’s almost like seeing another world as you walk past. And then of course you’ve got the person who’s been correcting people’s grammar, so that’s pretty cool too. Awesome post! I thought your artwork was really creative. Was eating chocolate reading this. There is so much!!! P.S- Thanks for recognizing this!